Cindy and her friend Kiva had an idea to hold a virtual thrift shopping trip on our blogs. I don’t even need an excuse, really, to go thrifting. But signing up for this gig absolutely made it mandatory. Unfortunately my stinkin’ job got in the way of my fun last week. My phone wouldn’t stop ringing and the work came pouring in. I even had to work on SATURDAY! The saturday gig was really annoying because it prevented me from driving to D.C. to go to the Big Flea with BFF Beth. So inbetween work and more work I managed to squeeze in a few side trips to just a few of the prolific number of thirft stores in my area. I visited one of the CHKD (Children’s Hospital of the King’s Daughters) in Norfolk, the CHKD in Hampton, Salvation Army in Virginia Beach and a CHKD in Newport News. I spent $3.45 on this lot. My 10 yo was thrilled with the tupperware jello molds! Now we have jiggly jellos for dinner! The swanky swig was marked down to $0.15 from $0.45 and that was it’s 2nd markdown! 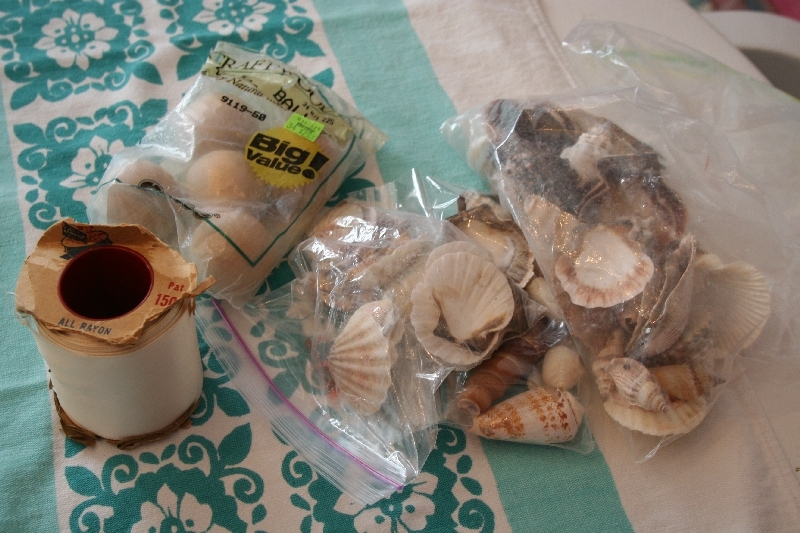 Seashells for $1.45 for all. Wooden balls for $0.65 and my favorite find was the vintage satin rayon ribbon for $1.96. It’s sooo soft! 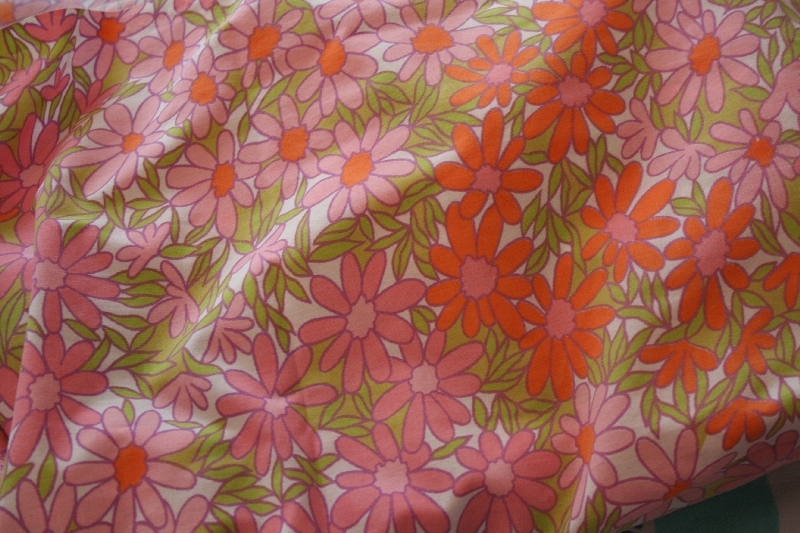 Lastly this vintage sheet for $1.96. Groovy. 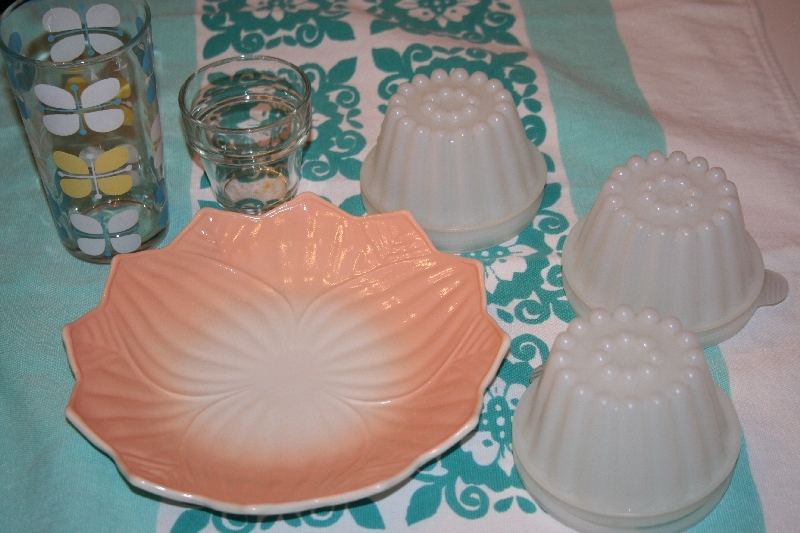 Are the little jello mold things tupperware or glass? Great finds for you at the thrift stores. I love the jello molds! so cute!! what great finds!! Great sheet – I’m really loving orange and pink at the moment. Hope next time you have a bit less work! Thanks for joining us and now go and have a cookie and smile at a job well done! And the jiggly jello, too! This was so fun, the best part seeing what everyone brought home. I love that vintage sheet, curious to see what it turns out to be. Of course my favorites are the wide ribbon and that FABULOUS pink daisy sheet fabric! I feel for you- having a job can really get in the way of FUN. At least you scored at the thrift stores! Cool stuff! What a great excuse to shop! Love your items, I really like that sheet. Thanks so much for joining us on the virtual shopping trip. Take care! yay! nice finds and nicer prices! woo hoo! there’s nothing like a good thrift shopping experience! Heh! I have the matching pillowcase to your sheet! Thrifted as well. Great finds! Groovy sheets! Lovin’ the daisies! Oh, and the $29 sewing machine you’ve written about in another post! super cool! sew away, girls!